BUFFALO, New York: Lawyers for Facebook are calling a man’s federal lawsuit claiming part ownership of the company ”a fraud & an affront on the court”. In their latest legal response, the lawyers for Facebook have accused Paul Ceglia of doctoring a 2003 contract that he says proves he bought into the Facebook founder Mark Zuckerberg’s idea for the site when Mr Zuckerberg was still at university. Mr Ceglia ”has now come out of the woodwork seeking billions in damages,” the response filed in the US District Court in Buffalo said. Mr Ceglia’s lawsuit relies on a two-page ”work for hire” contract. Mr Ceglia says he and Mr Zuckerberg signed the contract after Mr Zuckerberg responded to his help-wanted ad for work on a street-mapping database he was creating. 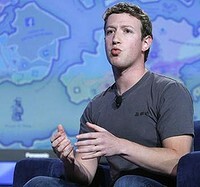 According to the lawsuit, Mr Ceglia paid Mr Zuckerberg $US1000 to develop software for the street-mapping project and gave him another $US1000 after Mr Zuckerberg told him about his Facebook idea, with the condition Mr Ceglia would get half if it took off. The company said the document was a fake. ”To be clear, Zuckerberg did not sign the purported agreement … which is a ‘cut-and-paste’ job fraudulently & self servingly manufactured by the plaintiff for this lawsuit,” the filing said.